Shareable images are available in Prosperity Now’s Toolkit. Each year, the IRS and national partners join in a coordinated outreach effort to increase tax credit eligibility awareness. 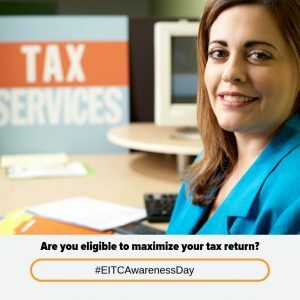 The 13th annual EITC Awareness Day is on Friday, January 25th, 2019. Tools and resources from the IRS include news releases, social media graphics, and a marketing kit. Prosperity Now’s 2019 EITC Awareness Toolkit provides data snapshots, shareable images, sample messaging, and more. Finally, take a look at the guest post we wrote on Why We Should Expand the Earned Income Tax Credit on our field partner Prosperity Now’s website (cross-posted below).